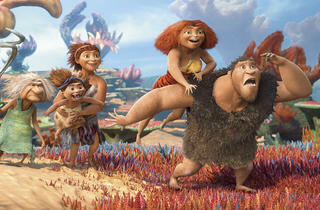 The Croods in this animation are a prehistoric family who have escaped death by disease, mammoth, big cat and other assorted nasties via the simple ruse of staying in their cave whenever they can. It’s a strategy dear to the heart of brawny patriarch Grug (Nicolas Cage) and naturally less appealing to curious teen Eep (Emma Stone). But it’s soon clear that the landscape, it is a-shifting, and the Croods must adapt or die. 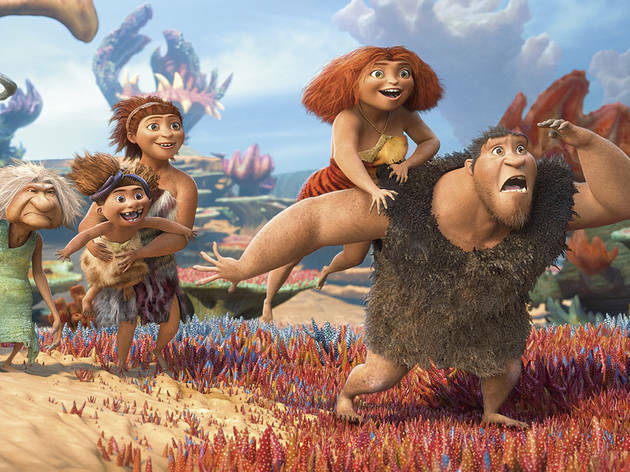 The theme of survival in the face of an apocalyptic event casts a bit of a shadow over proceedings, making The Croods almost the family entertainment entry into a canon including the likes of ‘Grave Of The Fireflies’ and ‘Threads’. Of course, being a DreamWorks animation and possible franchise, this isn’t a bleak emotional nightmare, but a luridly colourful caper that pokes us in the eyes with a succession of lavishly rendered 3D perils too quickly for any abiding melancholy to set in. It’s a frenetic approach that doesn’t leave much time to meet the family, but the characterisations are so broad and accessible (kind mum, crabby granny, thick son and so on) that this doesn’t matter much. It’s all entertaining enough, and will surely sell plenty of stuffed toys. But it winds up a fair few rungs below the likes of ‘Brave’ on the evolutionary ladder. A very entertaining and comical animated film by Dreamworks with a strong female lead and imaginative cinematography. I found myself laughing out loud many times throughout the film. It lacks the depth of character and storyline that some of the animated films can offer but it is still a very enjoyable watch nonetheless and one for both kids and grown ups. I have just been to a preview of what turned out to be a disappointment. It looks good and in places is funny but and it is a pretty big but the story isn't really up to it. Its a by the numbers old ways good new ways bad clash of the generations. Kids will be amused by it but parents and adults expecting something more for them will be disappointed. Don't get me wrong, it isn't bad but not as good as it could or should have been also I'm not sure the extra money for the 3D is worth it. A reasonable 3 star film but reasonable about sums it up. If you are looking for something to take the kids to over the forthcoming easter break wait to see the 3D reissue of Finding Nemo. I laughed more at the 2 minutes of the trailer for that than the whole of this film. Seen a preview and looks great even for the Adults, or should I say the big kids.